As Cannabis becomes increasingly used medicinally, more and more anecdotal evidence seems to point to its potential as an effective reliever of anxiety and hostility in certain cases of autism. Autism can sometimes seem like a hard condition to live with and an impossible condition to find reliable treatment for. Could Marijuana be the answer? Autism is a learning disability that effects 1 in every 100 children, typically making itself apparent in a child at around the age of 3 years old. ASD (Autism Spectrum Disorder) affects a person's behaviour, communication skills and grasp on social interaction. The learning disorder ranges widely from almost unnoticeable to cripplingly severe. In the case of a high functioning autistic person, autism can often manifest itself as language learning delays early on in development, and a lack of empathy or understanding for other people. High-functioning patients may have obsessive interests in very specific things or a poor understanding of social situations. While Studies have shown that in general they tend to have average or above average intelligence, to the untrained eye they might seem simply odd or socially awkward; unfortunately, this can often lead to them being teased and withdrawing into isolation. On the low-functioning end of the spectrum, individuals frequently have impairments in virtually all areas of development. They can be prone to self-injuring, tend to have very poor ability to remember names of people or places and in addition, many are epileptic. They can have severely limited expressive and receptive skills, with some patients being completely unable to talk or communicate at all. Due to this disparity between patients, finding a reliable treatment can be incredibly difficult, and classical medicines seem to have varied effects. While people with autism might share certain difficulties, the condition affects everyone differently, meaning that treatments need to be suited to match the patient. Mental impairment is tested purely with an IQ test, which is the differentiating factor in determining high functioning and low functioning individuals. It establishes how the patients are classified, whether they will be educated, and how. While this can naturally serve as a useful tool for the doctors in categorising patients to help find what will best suit their lifestyles in terms of treatment, it doesn't necessarily work. The nature of autism proves itself to be inexplicably more complex, making simple tests poorly suited to determining treatment. Here's where Cannabis comes in. It is thought that some forms of autism are actually the result of a shortage of natural endocannabinoids in the brain. Endocannabinoid Deficiency has been linked to a multitude of different conditions and diseases, and is thought to be a primary player in creating autism in children. Researchers at Stanford University found that symptoms of autism are caused by a genetic mutation that blocks natural endocannabinoid production and distorts the chemical's interaction with the brain. The natural endocannabinoid molecules, however, share a structural similarity with the phytocannabinoids molecules (like THC and CBD) found in herbs like cannabis. The Autism Research Institute discovered that by utilising controlled and safe doses of cannabis, a significant improvement in the behaviour of particular autistic patients occurred. Hostile, anxious, and self-destructive behaviour seemed to decrease. 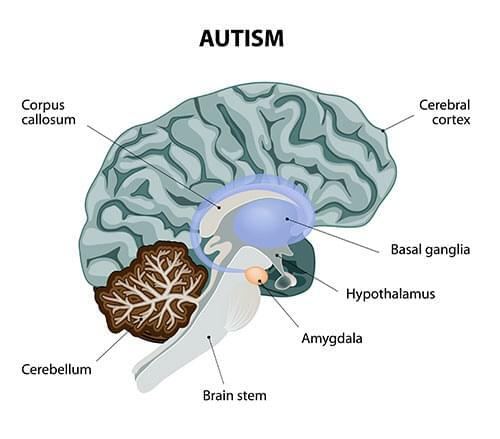 They note that autism is a highly treatable condition, it is just that the current pharmaceutical options often come with a range of nasty side effects. In 2008, a father from California was brave enough to broadcast to the world his experiences with medicating his autistic child using cannabinoid therapy. Based in California, where using cannabis under medical supervision is legal, the father had tried to contain his son's violent and destructive mood swings with a wide range of pharmaceuticals before finally deciding to try doses of cannabis. He fed his son a concentration of cannabinoids twice a day (the substance was not decarboxylated, meaning it wouldn't have had any mind-altering effects on the child) and reported an immense relief from his child's previous behaviour. Whereas some prescription drugs had only worsened his tendency to violently lash out, dosing with THC-A (the raw form of THC produced by cannabis juicing) his son became calmer, happier and less anxious. However, while dosing with cannabis was a resounding success in this case, it doesn't mean it is a flawless solution. Symptoms of autism vary wildly and finding the right one for an individual is vital in managing this unpredictable learning disability. Without a doubt, in-depth clinical research is required. Living with autism often requires kindness, perseverance, and an outstanding patience. It is inspiring accounts of success like the one above that move us closer to a world where cannabis may be more easily accessed by those who truly need it.